Founded in 1858 and coeducational from its start, Iowa State became the nation's first designated land-grant institution when the Iowa Legislature accepted the provisions of the 1862 Morrill Act on September 11, 1862, making Iowa the first state in the nation to do so. William M. Beardshear was appointed President of Iowa State in 1891. During his tenure, Iowa Agricultural College truly came of age. Beardshear developed new agricultural programs and was instrumental in hiring premier faculty members such as Anson Marston, Louis B. Spinney, J.B. Weems, Perry G. Holden, and Maria Roberts. He also expanded the university administration, and the following buildings were added to the campus: Morrill Hall (1891); the Campanile (1899); Old Botany (now Carrie Chapman Catt Hall) (1892); and Margaret Hall (1895) which continue to stand today. In his honor, Iowa State named its central administrative building (Central Building) after Beardshear in 1925. In 1898, reflecting the school's growth during his tenure, it was renamed Iowa State College of Agricultural and Mechanic Arts, or Iowa State for short. In 1912 Iowa State had its first Homecoming celebration. The idea was first proposed by Professor Samuel Beyer, the college's “patron saint of athletics,” who suggested that Iowa State inaugurate a celebration for alumni during the annual football game against rival University of Iowa. Iowa State's new president, Raymond A. Pearson, liked the idea and issued a special invitation to alumni two weeks prior to the event: “We need you, we must have you. Come and see what a school you have made in Iowa State College. Find a way.” In October 2012 Iowa State marked its 100th Homecoming with a "CYtennial" Celebration. Iowa State celebrated its first VEISHEA on May 11–13, 1922. Wallace McKee (class of 1922) served as the first chairman of the Central Committee and Frank D. Paine (professor of electrical engineering) chose the name, based on the first letters of Iowa State's colleges: Veterinary Medicine, Engineering, Industrial Science, Home Economics, and Agriculture. VEISHEA grew to become the largest student-run festival in the nation. 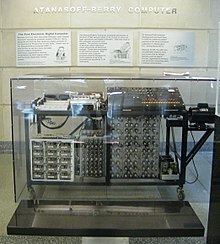 While attempting to develop a faster method of computation, mathematics and physics professor John Vincent Atanasoff conceptualized the basic tenets of what would become the world's first electronic digital computer, the Atanasoff-Berry Computer (ABC), during a drive to Illinois in 1937. These included the use of a binary system of arithmetic, the separation of computer and memory functions, and regenerative drum memory, among others. The 1939 prototype was constructed with graduate student Clifford Berry in the basement of the Physics Building. Official names given to the university's divisions were the College of Agriculture, College of Engineering, College of Home Economics, College of Sciences and Humanities, and College of Veterinary Medicine. In 2016-17 Iowa State university became part of only fifty-four institutions in the U.S. to have earned the "Innovation and Economic Prosperity University" designation by the Association of Public and Land-grant Universities. Overall, ISU ranks 111th in the U.S. News & World Report ranking of national universities and 42nd in the Washington Monthly rankings. The agriculture and forestry programs are consistently ranked top 15 in the world by QS. In engineering specialties, at schools whose highest degree is a doctorate, Iowa State's biological/agricultural engineering program is ranked first, the mechanical and civil are ranked 9th and 16th nationally in the U.S. by U.S. News & World Report. Almost all of the engineering specialities at ISU are ranked in the top 30 nationally... ISU's chemistry and physics programs are considered to be some of the best in the world and are ranked in the Top 100 globally and in Top 50 nationally. ISU's Greenlee School of Journalism and Mass Communication is one of the top journalism schools in the country and is notable for being among the first group of accredited journalism and mass communication programs. Greenlee is also cited as one of the leading JMC research programs in the nation, ranked 23rd in a publication by the AEJMC. In 2016, ISU's landscape architecture program was ranked as the 10th best undergraduate program in the nation, and architecture as the 18th best. The Library's extensive collections include electronic and print resources that support research and study for all undergraduate and graduate programs. Nationally recognized collections support the basic and applied fields of biological and physical sciences. The Parks Library includes four public service desks: the Learning Connections Center, the Circulation Desk, the Media Center (including Maps, Media, Microforms, and Course Reserve collections), and Special Collections. The Library's instruction program includes a required undergraduate information literacy course as well as a wide variety of subject-based seminars on effective use of Library resources for undergraduate and graduate students. Iowa State is the birthplace of the first electronic digital computer, starting the world's computer technology revolution. Invented by mathematics and physics professor John Atanasoff and engineering graduate student Clifford Berry during 1937-42, the Atanasoff-Berry Computer, or ABC, pioneered important elements of modern computing, including binary arithmetic, regenerative memory, parallel processing, electronic switching elements, and separation of memory and computer functions. The Extension Service traces its roots to farmers' institutes developed at Iowa State in the late 19th century. Committed to community, Iowa State pioneered the outreach mission of being a land-grant college through creation of the first Extension Service in 1902. In 1906, the Iowa Legislature enacted the Agricultural Extension Act making funds available for demonstration projects. It is believed this was the first specific legislation establishing state extension work, for which Iowa State assumed responsibility. The national extension program was created in 1914 based heavily on the Iowa State model. ISU is the only university in the United States that has a U.S. Department of Energy research laboratory physically located on its campus. Iowa State played a critical role in the development of the atomic bomb during World War II as part of the Manhattan Project, a research and development program begun in 1942 under the Army Corps of Engineers to develop the atomic bomb. The process to produce large quantities of high-purity uranium metal became known as the Ames process. One-third of the uranium metal used in the world's first controlled nuclear chain reaction was produced at Iowa State under the direction of Frank Spedding and Harley Wilhelm. The Ames project received the Army-Navy 'E' Award for Excellence in Production on October 12, 1945, signifying two-and-one-half years of excellence in industrial production of metallic uranium as a vital war material. Iowa State is unique among educational institutions to have received this award for outstanding service, an honor normally given to industry. Iowa State is the only university in the United States that has a U.S. Department of Energy research laboratory physically located on its campus. Operated by Iowa State, the Ames Laboratory is one of ten national DOE Office of Science research laboratories. The Engineering Teaching and Research Complex was built in 1999 and is home to Stanley and Helen Howe Hall and Gary and Donna Hoover Hall. The complex is occupied by the Virtual Reality Applications Center (VRAC), Center for Industrial Research and Service (CIRAS), Department of Aerospace Engineering and Engineering Mechanics, Department of Materials Science and Engineering, Engineering Computer Support Services, Engineering Distance Education, and Iowa Space Grant Consortium. And the complex contains one of the world's only six-sided immersive virtual reality labs (C6), as well as the 240 seat 3D-capable Alliant Energy Lee Liu Auditorium, the Multimodal Experience Testbed and Laboratory (METaL), and the User Experience Lab (UX Lab). All of which supports the research of more than 50 faculty and 200 graduate, undergraduate, and postdoctoral students. The Brunnier Art Museum, Iowa's only accredited museum emphasizing a decorative arts collection, is one of the nation's few museums located within a performing arts and conference complex, the Iowa State Center. Founded in 1975, the museum is named after its benefactors, Iowa State alumnus Henry J. Brunnier and his wife Ann. The decorative arts collection they donated, called the Brunnier Collection, is extensive, consisting of ceramics, glass, dolls, ivory, jade, and enameled metals. Located near the center of the Iowa State campus, the Farm House Museum sits as a monument to early Iowa State history and culture as well as a National Historic Landmark. As the first building on campus, the Farm House was built in 1860 before campus was occupied by students or even classrooms. The college's first farm tenants primed the land for agricultural experimentation. This early practice lead to Iowa State Agricultural College and Model Farm opening its doors to Iowa students for free in 1869 under the Morrill Act (or Land-grant Act) of 1862. Many prominent figures have made the Farm House their home throughout its 150 years of use. 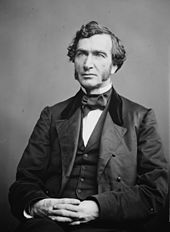 The first president of the College, Adonijah Welch, briefly stayed at the Farm House and even wrote his inaugural speech in a bedroom on the second floor. James “Tama Jim” Wilson resided for much of the 1890s with his family at the Farm House until he joined President William McKinley's cabinet as U.S. Secretary of Agriculture. Agriculture Dean Charles Curtiss and his young family replaced Wilson and became the longest resident of Farm House. The traditional public art program began during the Depression in the 1930s when Iowa State College's President Raymond Hughes envisioned that "the arts would enrich and provide substantial intellectual exploration into our college curricula." Hughes invited Grant Wood to create the Library's agricultural murals that speak to the founding of Iowa and Iowa State College and Model Farm. He also offered Christian Petersen a one-semester sculptor residency to design and build the fountain and bas relief at the Dairy Industry Building. In 1955, 21 years later, Petersen retired having created 12 major sculptures for the campus and hundreds of small studio sculptures. The Christian Petersen Art Museum in Morrill Hall is named for the nation's first permanent campus artist-in-residence, Christian Petersen, who sculpted and taught at Iowa State from 1934 through 1955, and is considered the founding artist of the Art on Campus Collection. As part of University Museums, the Christian Petersen Art Museum at Morrill Hall is the home of the Christian Petersen Art Collection, the Art on Campus Program, the University Museums's Visual Literacy and Learning Program, and Contemporary Changing Art Exhibitions Program. The sculpture garden is adjacent to Iowa State's 22 acres (89,000 m2) central campus. Adonijah Welch, ISU's first president, envisioned a picturesque campus with a winding road encircling the college's majestic buildings, vast lawns of green grass, many varieties of trees sprinkled throughout to provide shade, and shrubbery and flowers for fragrance. Today, the central lawn continues to be an iconic place for all Iowa Staters, and enjoys national acclaim as one of the most beautiful campuses in the country. The new Elizabeth and Byron Anderson Sculpture Garden further enhances the beauty of Iowa State. Iowa State operates 20 on-campus residence halls. The residence halls are divided into geographical areas. Buchanan Hall and Geoffroy Hall are nominally considered part of the RCA, despite their distance from the other buildings. The governing body for ISU students is ISU Student Government. The ISU Student Government is composed of a president, vice president, finance director, cabinet appointed by the president, a clerk appointed by the vice president, senators representing each college and residence area at the university, a nine-member judicial branch and an election commission. The Choral Division of the Department of Music and Theater at Iowa State University consists of over 400 choristers in four main ensembles – the Iowa State Singers, Cantamus, the Iowa Statesmen, and Lyrica – and multiple small ensembles including three a cappella groups, Count Me In (female), Shy of a Dozen (male), and "Hymn and Her" (co-ed). The first fraternity, Delta Tau Delta, was established at Iowa State in 1875, six years after the first graduating class entered Iowa State. The first sorority, I.C. Sorocis, was established only two years later, in 1877. I.C. Sorocis later became a chapter of the first national sorority at Iowa State, Pi Beta Phi. Anti-Greek rioting occurred in 1888. As reported in The Des Moines Register, "The anti-secret society men of the college met in a mob last night about 11 o'clock in front of the society rooms in chemical and physical hall, determined to break up a joint meeting of three secret societies." In 1891, President William Beardshear banned students from joining secret college fraternities, resulting in the eventual closing of all formerly established fraternities. President Storms lifted the ban in 1904. Football first made its way onto the Iowa State campus in 1878 as a recreational sport, but it was not until 1892 that Iowa State organized its first team to represent the school in football. In 1894, college president William M. Beardshear spearheaded the foundation of an athletic association to officially sanction Iowa State football teams. The 1894 team finished with a 6-1 mark. The Cyclones compete each year for traveling trophies. Since 1977, Iowa State and Iowa compete annually for the Cy-Hawk Trophy. Iowa State competes in an annual rivalry game against Kansas State known as Farmageddon and against former conference foe Missouri for the Telephone Trophy. The main rival is the Iowa Hawkeyes. Unfortunately for Iowa State, this competition has not gone well in recent years. The Hawkeyes have won the last four games. Nevertheless, this rivalry has provided excitement for fans from Ames and Iowa City alike. The Cyclones play their home games at Jack Trice Stadium, named after Jack Trice, ISU's first African-American athlete and also the first and only Iowa State athlete to die from injuries sustained during athletic competition. Trice died three days after his first game playing for Iowa State against Minnesota in Minneapolis on October 6, 1923. Suffering from a broken collarbone early in the game, he continued to play until he was trampled by a group of Minnesota players. It is disputed whether he was trampled purposely or if it was by accident. The stadium was named in his honor in 1997 and is the only NCAA Division I-A stadium named after an African-American. Jack Trice Stadium, formerly known as Cyclone Stadium, opened on September 20, 1975, with a win against the United States Air Force Academy. The 2013-14 campaign turned out to be another highly successful season. Iowa State went 28-8, won the Big 12 Tournament, and advanced to the Sweet Sixteen by beating North Carolina in the second round of the NCAA Tournament. The Cyclones finished 11-7 in Big 12 play, finishing in a tie for third in the league standings, and beat a school-record nine teams (9-3) that were ranked in the Associated Press top 25. The Cyclones opened the season 14-0, breaking the school record for consecutive wins. Melvin Ejim was named the Big 12 Player of the Year and an All-American by five organizations. Deandre Kane was named the Big 12 Tournament's most valuable player. On June 8, 2015, Steve Prohm took over as head basketball coach replacing Hoiberg who left to take the head coaching position with the Chicago Bulls. In his first season with the Cyclones, Prohm secured a #4 seed in the Midwest region where the Cyclones advanced to the Sweet Sixteen before falling to top-seeded Virginia, 84-71. In 2017, Iowa State stunned 3rd ranked Kansas, 92-89, in overtime, snapping KU's 54-game home winning streak, before winning the 2017 Big 12 Men's Basketball Tournament, its third conference championship in four years, defeating West Virginia in the final. Of Iowa State's 19 NCAA Tournament appearances, the Cyclones have reached the Sweet Sixteen six times (1944, 1986, 1997, 2000, 2014, 2016), made two appearances in the Elite Eight (1944, 2000), and reached the Final Four once in 1944. Coach Christy Johnson-Lynch led the 2012 Cyclones team to a fifth straight 20-win season and fifth NCAA regional semifinal appearance in six seasons, and leading Iowa State to a 22-8 (13-3 Big 12) overall record and second-place finish in the conference. The Cyclones finished the season with seven wins over top-25 teams, including a victory over No. 1 Nebraska Cornhuskers in Iowa State's first-ever win over a top-ranked opponent in addition to providing the only Big 12 Conference loss to the 2012 conference and NCAA champion Texas Longhorns. 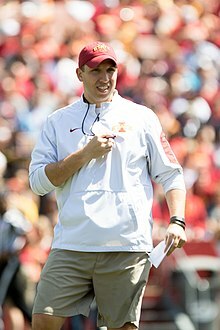 Johnson-Lynch is the fastest Iowa State coach to clinch 100 victories. In 2011, she became the school's winningest volleyball coach when her team defeated the Texas Tech Red Raiders, her 136th coaching victory, in straight sets. In 2002, under former NCAA champion & Olympian Coach Bobby Douglas, Iowa State became the first school to produce a four-time, undefeated NCAA Division I champion, Cael Sanderson (considered by the majority of the wrestling community to be the best college wrestler ever), who also took the gold medal at the 2004 Olympic Games in Athens, Greece. Dan Gable, another legendary ISU wrestler, is famous for having lost only one match in his entire Iowa State collegiate career - his last - and winning gold at the 1972 Olympics in Munich, Germany, while not giving up a single point. In February 2017, former Virginia Tech coach and 2016 NWCA Coach of the Year Kevin Dresser was introduced as the new Cyclone wrestling coach, replacing Kevin Jackson. ^ . "Endowment Funds_FY18" (PDF). Iowa State University - Finances. April 16, 2019. ^ a b c d "Final Enrollment – Fall 2017". Iowa State University - Office of the Registrar. September 6, 2017. ^ "Color Palette - Brand Standards". Brandmarketing.iastate.edu. Retrieved 2017-01-18. ^ "Iowa State University". Carnegie Foundation for the Advancement of Teaching. Retrieved December 20, 2010. ^ a b "Iowa State: 150 Points of Pride". Iowa State University. Archived from the original on June 21, 2015. Retrieved October 2, 2013. ^ a b "Sesquicentennial Message from President". Iowa State University. Retrieved 8 September 2011. ^ "History of Iowa State Homecoming". Iowa State University Alumni Association Website. ^ a b c "John Vincent Atanasoff and the Birth of Electronic Digital Computing". iastate.edu. ^ "ISU Naval ROTC - Unit History". Ames, Iowa: Iowa State University. 2011. Archived from the original on January 11, 2012. Retrieved September 28, 2011. ^ "Iowa State University enrollment is 36,001 - News Service - Iowa State University". www.news.iastate.edu. Retrieved 2015-09-10. ^ "Colleges and departments - Department Title - Iowa State University". Web.iastate.edu. Retrieved 2014-08-23. ^ Edelson, David. "IEP Designees". www.aplu.org. Retrieved 2016-09-15. ^ a b "Iowa State University -U.S. News Best Colleges Rankings". U.S. News & World Report. Retrieved September 15, 2016. ^ "Iowa State University | Academic Ranking of World Universities - 2016 | Shanghai Ranking - 2016". Retrieved 2016-09-03. ^ "About Greenlee School of Journalism and Communication". Archived from the original on 2011-08-22. Retrieved 2011-08-31. ^ "Greenlee School Research Ranks in Top 30". 2010. Archived from the original on 2011-05-06. Retrieved 2011-06-03. 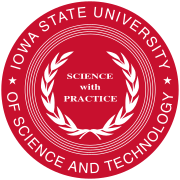 ^ "NSF – NCSES Academic Institution Profiles – Iowa State University". ncsesdata.nsf.gov. Archived from the original on 2017-01-25. Retrieved 2017-10-25. ^ "National rankings place ISU'S landscape architecture 10th and architecture 18th". Iowa State University News Service. September 29, 2016. ^ "Extension Service: A Historical Perspective". Retrieved 2016-11-17. ^ "Land-grant universities born from radical idea". Archived from the original on May 27, 2010. Retrieved June 28, 2010. ^ "Patent US2830894 - Production of uranium". google.com. ^ "Veishea ends at Iowa State; new traditions will begin with 'thoughtful approach'". Iowa State University News Service. Iowa State University. Retrieved 2014-08-30. ^ a b Holger, Dave (1999-10-20). "News". ENGINEERING TEACHING AND RESEARCH COMPLEX FACTS. Retrieved 2018-08-28. ^ "Facilities". Virtual Reality Applications Center. 2013-12-10. Retrieved 2018-08-28. ^ "VRAC". Virtual Reality Applications Center. 2013-12-10. Retrieved 2018-08-28. ^ "Rock Plaque". Fpm.iastate.edu. 1999-09-20. Retrieved 2014-08-23. ^ Gaines, Thomas (1991). The Campus as a Work of Art. New York: Praeger Publishers. p. 155. ^ Iowa State University Alumni Association. "Ring Symbolism"
^ Iowa State University Alumni Association. "Official University Mace"
^ "News Releases: Iowa State University". iastate.edu. 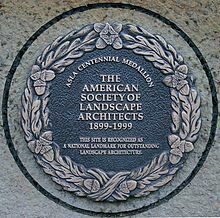 ^ "Anderson Sculpture Garden Main". iastate.edu. ^ "ISU promotes sustainability via an all-university compost facility". Iowa State University News. Retrieved 2009-06-10. ^ "New web site charts campus building energy use". Iowa State University. Archived from the original on 2009-04-20. Retrieved 2009-06-10. ^ "Live Green revolving loan fund". Iowa State University News. Archived from the original on 2009-05-03. Retrieved 2009-06-10. ^ "Government of the Student Body - Iowa State University". iastate.edu. ^ "Greek Community Membership Statistics" (PDF). Iowa State University Office of Greek Affairs. 2007-11-01. Archived from the original (PDF) on 2008-05-16. Retrieved 2008-08-07. ^ Alpha Chi Omega (2009). "Alpha Chi Omega". Archived from the original on 2010-09-17. Retrieved 2010-05-09. ^ Pi Chapter. "ADPi". Alpha Delta Pi Sorority. Archived from the original on 2009-02-17. Retrieved 2010-05-09. ^ Rho Chapter (Alpha Gamma Delta) (2010). "Welcome to the Rho Chapter of Alpha Gamma Delta!". Chapter Communications. Archived from the original on 2010-05-07. Retrieved 2010-05-09. ^ Miller, W.J. (1961). "Greek Community Origins from Fraternities & Sororities at Iowa State". Iowa State University Office of Greek Affairs. Archived from the original on 2008-07-19. Retrieved 2008-08-07. ^ The Scroll of Phi Delta Theta, Vol. XXXVII, (1912-1913) p 542, edited by Davis, T.
^ "Iowa State Daily Named Best Student Newspaper in the Country | Greenlee School of Journalism and Communication". Greenlee.iastate.edu. Archived from the original on 2016-10-18. Retrieved 2017-01-18. 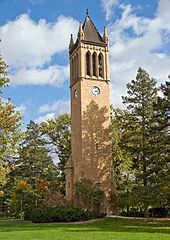 ^ "History of Iowa State: Time Line, 1875-1899. Iowa State University. 2007". Archived from the original on 2009-04-10. ^ "Iowa State Media Guide-Records. 2008" (PDF). Archived from the original (PDF) on 2015-09-23. ^ "Iowa State Bill Fennelly Bio. Retrieved June 2010". Archived from the original on 2011-02-28. ^ Gouldsmith, Ben (March 14, 2012). "Women's Basketball: Climbing the attendance charts". Ames Tribune. Retrieved March 17, 2012. ^ "Cyclone Wrestlers Ready For NCAA's". cyclones.com. 2008-03-18. Retrieved 2008-06-09. ^ "#1 Online Publisher for wrestling videos". Flowrestling. Retrieved 2014-01-01. ^ "Kevin Jackson ISU Athletics". Iowa State University Athletics. Archived from the original on 2013-11-15. Retrieved 2014-01-01. ^ Times, Clyde Haberman and Special To the New York. "MAN IN THE NEWS: Lee Teng-hui; Taiwan's Leader and Son of the Soil". Retrieved 2018-11-25. "Iowa State College of Agriculture and Mechanical Arts" . Collier's New Encyclopedia. 1921. "Iowa State College of Agriculture and Mechanic Arts" . New International Encyclopedia. 1905.